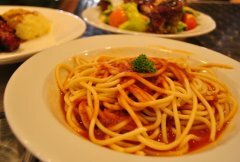 1.In Western restaurants, formal meals have 7 courses. But you don’t need to order all 7 courses because it is an improper behavior if you order too much and don’t finish. There are some impolite behaviors like talking about business during the meal, eating too slowly, only ordering an appetizer instead of a main dish and so on. Normally you can order an appetizer, main dish and a dessert which is the best choice. 2．Generally speaking, certain courses should be paired with certain wines. For example, red meat demands a red wine, white meat suits a white wine, while sweet wine matches desserts. Red meat is heavy so you can choose red wine with heavier meals. White meat has a light flavor which can be paired with white wine. Due to different cooking styles, it’s better to choose different drinks. For example, if the dish is heavy and spicy, you can choose stronger and heavier red wine. If you order both red wine and white wine, you should follow the principle of eating fish first then meat. 3. 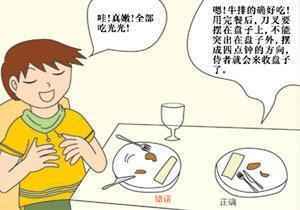 Normally, westerners use knives and forks to eat, which is totally different from Chinese. During the meal, if you need to leave the table for a minute, you should put down the knife and fork on both sides of the plate. Avoid taking the napkin to wipe your month while the other hand is still holding the knife or fork. It is also impolite to take food with one hand while the other hand is holding a glass of wine. Remember, at any time, don’t put one side of your knife/fork on the plate while the other side is on the table.If you have finished your meal, you should put the knife and fork side by side on the plate to show that the plate can be removed. EG. Sasa is a PR manager of a famous foreign trade company. In order to cater to clients from different countries, she always learns about manners for a formal western dinner like matters needing attention and some taboos in different cultures. By learning western etiquette, she avoids inappropriatebehaviors such as ordering the wrong drinks or improper usage of knife and fork. Her graceful behavior at important occasions has gained respect and love from clients in different countries. Throughout time, Sasa built up good relationships with hundreds of clients and earned lots of profits for the company.